This small lakeside town – especially the area called simply ‘Lakeside’ – is synonymous with being a trekker’s town. It is a place where would-be trekkers spend their acclimatization days before trekking up into the Annapurnas. And it is a place where they return to recuperate, before going on their way. 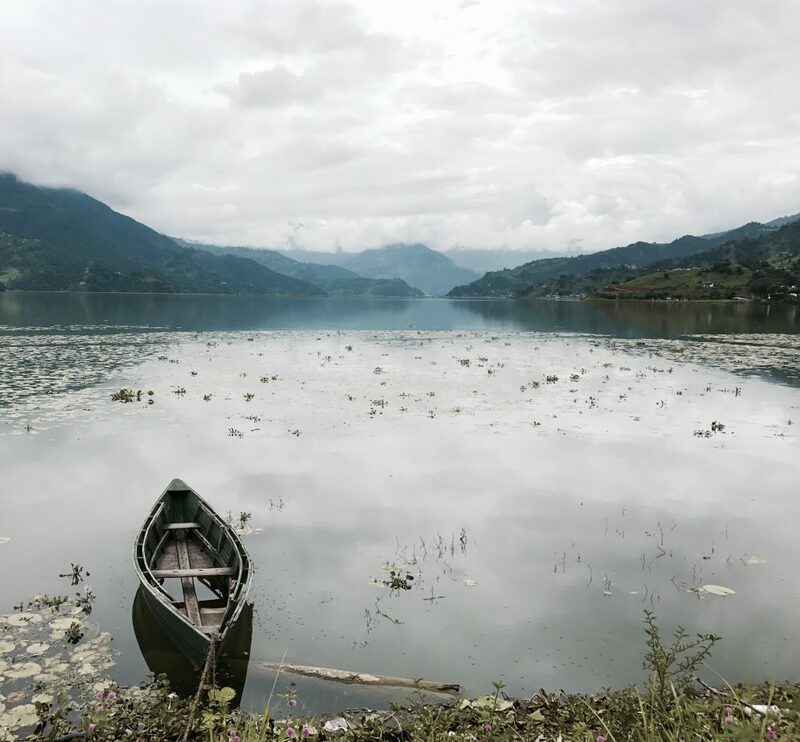 But is there anything in Pokhara Lakeside itself, for the non-trekking tourist? During my own post-trek recovery time, I discovered the eightfold attractions of Pokhara town itself. The ‘lake’ meant by ‘lakeside’ is called Lake Phewa. The tourist part of Lakeside is lined with restaurants, often with rooftop dining that overlooks the lake. Slightly away, there is a paved path lined with trees, that make for a pleasant stroll by the lake. Here you would encounter jewelry sellers hawking their wares on the grass, many of whom are Tibetan refugees from the nearby camp, where the bracelets and necklaces are hand made. Nepal shelters a great many refugees from Tibet, and has done so for many decades. There are also boating stations, run by the local boating association. From these you could hire a boat for a cruise on the lake, or to a little island within Lake Phewa where there is a sunken Hindu temple. Unsurprisingly, there are massage houses in Lakeside, many of which advertise trekking-related massages. Extremely welcome following a trek in the Annapurnas, they are also nonetheless pleasant ‘just because’. However, if you’re looking for a more unusual kind of massage, you can opt to experience ‘sound massage’. You can find this vibration therapy from Nepali music shops specialising in music using the ingenious ‘singing bowls’ of Nepal. Aside from Kathmandu itself, Pokhara is a great place to find bargains on outdoor and weatherproof clothing, particularly if you’re an average Western size. (Not so great for petite sized people). So much so that it is the only place I’ve ever been in a third world country, where the locals themselves go about with gore-tex jackets – a sensible solution to the mid-year monsoon weather. There are just as many shops selling semiprecious stones and jewelry in Lakeside, as there are refugee sellers by the lakeside proper. The shops have a wider range of goods. Additionally, there are also a couple places where you could take classes to learn how to make the jewelry. Which would be a nice twist for the jewelry enthusiast! Being a tourist town, Pokhara Lakeside has its souvenir shops. These range from typical souvenirs to trinkets and arts unique to Nepal. If you browse along the main street of Lakeside, you would encounter a shop or two run by Yes Helping Hands, a Nepali charity for the disabled. These sell handicrafts made by the deaf and blind community. The charity works with such communities to provide the skills and training to acquire an independent livelihood. I learned to my surprise that there is a Kashmiri community in Pokhara. These set up shops in Lakeside selling – what else? – cashmere. Unlike cheap mass-farmed, mass-produced cashmere (also called pashmina) that you might find being sold in the malls of your country, you can find in these shops genuine, high quality, pure cashmere. You will instantly know the difference the moment you touch the product. The best cashmere are those imported from Kashmir, and these are also the most expensive. That said, it is still a great deal for that quality of cashmere and better than you could get outside of the region. Although primarily a Hindu nation, Nepal also has a sizeable Buddhist population. Indeed, the Buddha was born as Prince Siddharta in Lumbini, Nepal. Thus Buddhism exerts a significant cultural presence in Nepal despite being the religion of only about 10% of the population. Thanka paintings are an example of this cultural manifestation. A type of religious Buddhist painting, it often depicts Buddhist scenes or a mandala, a Buddhist meditation focal point representing the cosmos. You can buy thanka art in Lakeside shops, or even take classes to learn this technique yourself! This last one is not actually in Lakeside. However, it is a prominent sight high up on the hill when you walk along Lake Phewa. 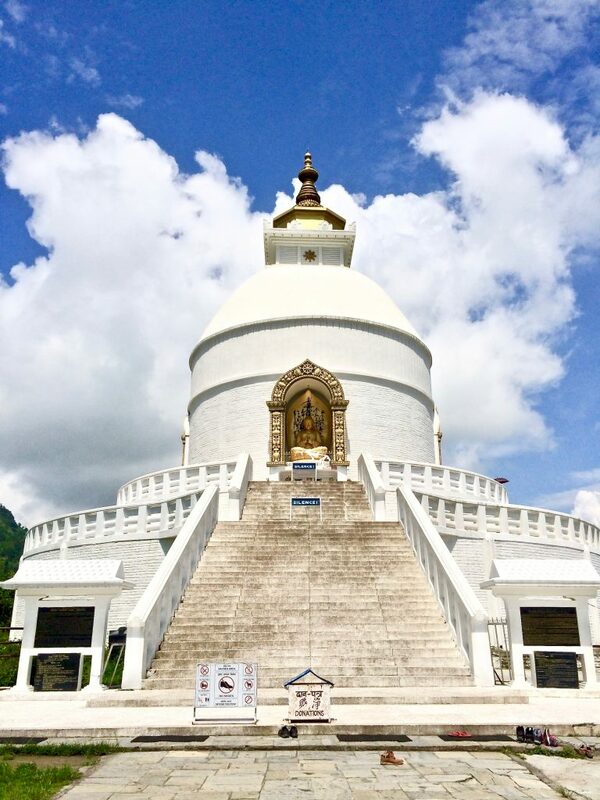 This is a Buddhist pagoda built by a group of Japanese Buddhists, whose founder was inspired to build 100 peace pagodas throughout the world after witnessing the nuclear devastation suffered by Hiroshima and Nagasaki in World War 2. You could take a boat to the edge of the lake closest to the Pagoda and hike up to the pagoda steps. An easier route is to hire a car to drive up to the bottom of the steps, and walk up.